Japan’s 1st Video Game Console was released 40 Years ago! This weekend is a very special one. It’s the 30th Birthday of the release of Super Mario Brothers (September 13th, 1985) on the Nintendo’s NES/Famicom console, one of the biggest milestones in video game history. But something else happened on this weekend, albeit not 30 but 40 years ago. On September 12th, 1975, the Japanese electronic toy manufacturer EPOCH (エポック株式会社) launched a video game machine called Electrotennis, or as it was known in Japan: テレビテニス (“Terebitenisu”, or Television Tennis), making this the very first Japanese video game. 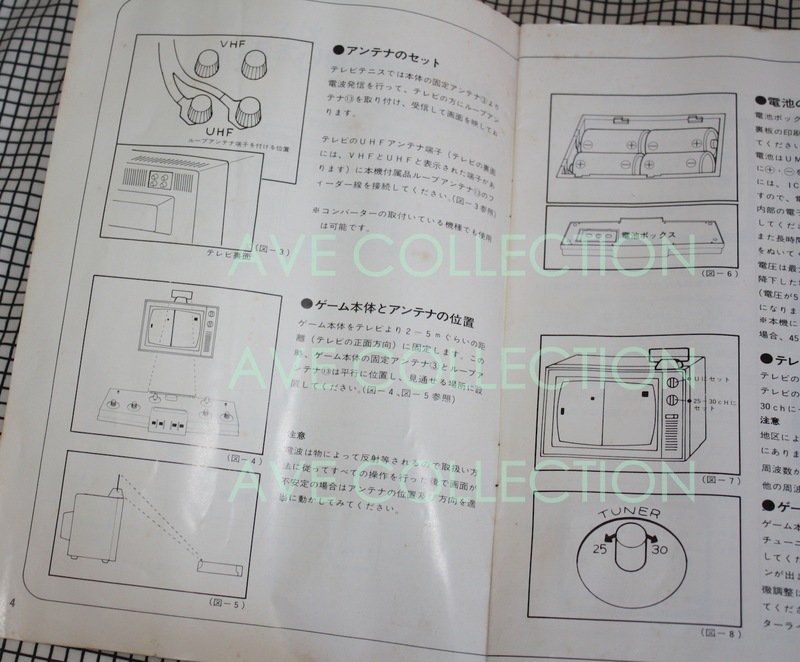 Epoch’s Electrotennis was available in stores on September 12th, 1975 for ¥19’000. In 2005, Epoch released a set of Gashapons, compiled of miniature consoles from their days in the video game industry. This is the only source known to me that reveals anything about the actual sales of this console, and it claims that 10,000 units have sold. This is a very small number, as later consoles (e.g. TV Vader and Super Cassette Vision) were stated to have sold in the 100,000’s or even beyond 1 million units. 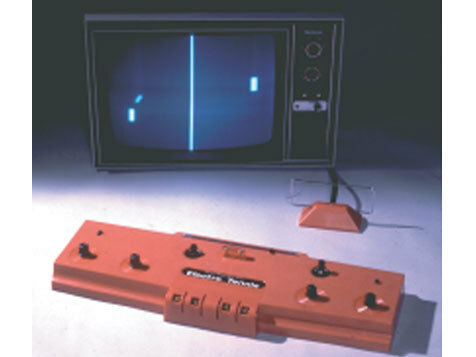 Epoch’s Electrontennis came out only three years after the world’s first game console, the Magnavox Odyssey (1972). Even though it is technically little more than a Pong device, it predates the original Atari Pong home console by several months. Atari Pong (Sears-version) came out in late 1975, and the Atari-version was to follow in 1976. An old advertisement for the wireless Electrotennis hardware! 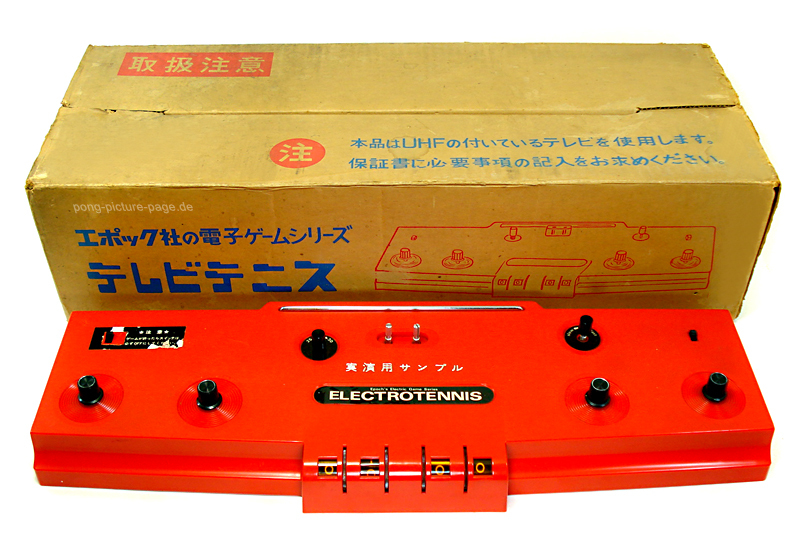 But Electrotennis is not only famous for being the first console to come from Japan, but also for its unique use of UHF technology. All other Pong consoles that I am aware of, including the Atari Pongs from the early days, use an RF-connector to transmit the picture from the console to the TV. In addition, they will of course require a power adaptor. Epoch’s console needs neither of these to function! Instead, it is powered by four batteries. The image is transmitted through an integrated antenna. Included with the console is a small receiver (visible on the picture above) which is connected to the TV’s UHF-receiver. That way, the console can operate completely wireless using UHF and batteries – a truly visionary design among video game consoles, and for 1975 in particular. Excerpt from the instruction manual. It explains how to set up the antenna that transmits the image to the TV wirelessly. The picture below shows a silver variant of the Electrotennis console. Little is known about it, but there seems to be a lack of Epoch company branding on both the box and the device. This image is taken from pong-picture-page.de, a database of Pong consoles. According to the site, this is a rare variant of the console, but apparently by another company. The case seems to be identical, but the lack of branding leads me to think that this may be either a knock-off or an early demo unit. I was lucky enough to stumble over a brand-new Electrotennis on a Japanese website a few years ago. 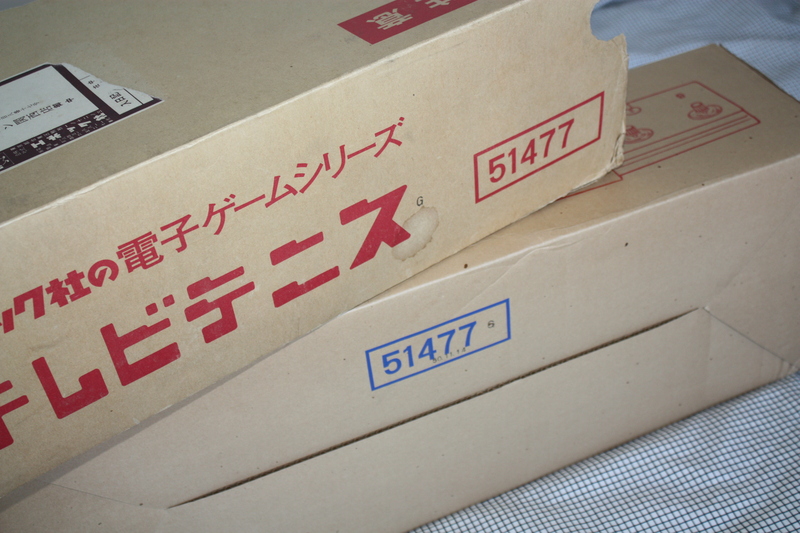 The seller wrote that it is “old stock from a toy shop”, and that it is brand-new. The following pictures are taken from my personal collection and show a brand-new copy. As fresh as 40 years ago? Note the time stamp on the Box: 50/11/14. 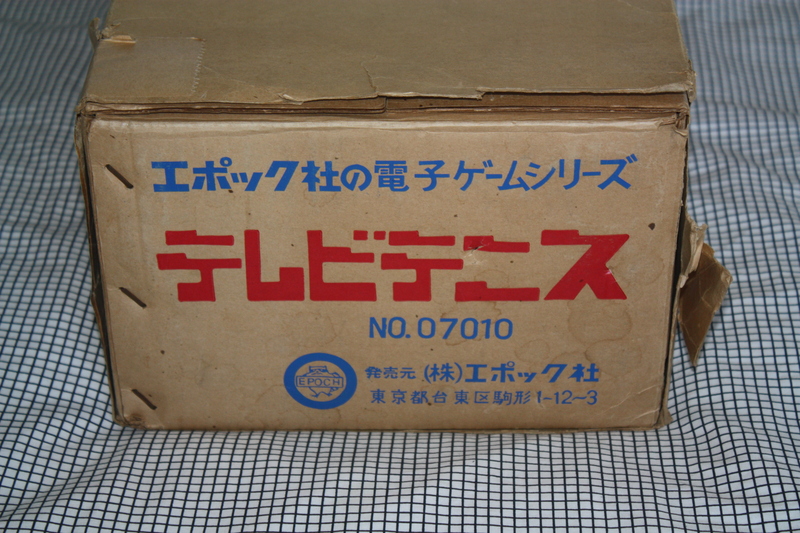 50年 in the Shouwa period is 1975, so this console was made/sold on November 14th 1975. This seems to be unit #7010 of 10,000 units. 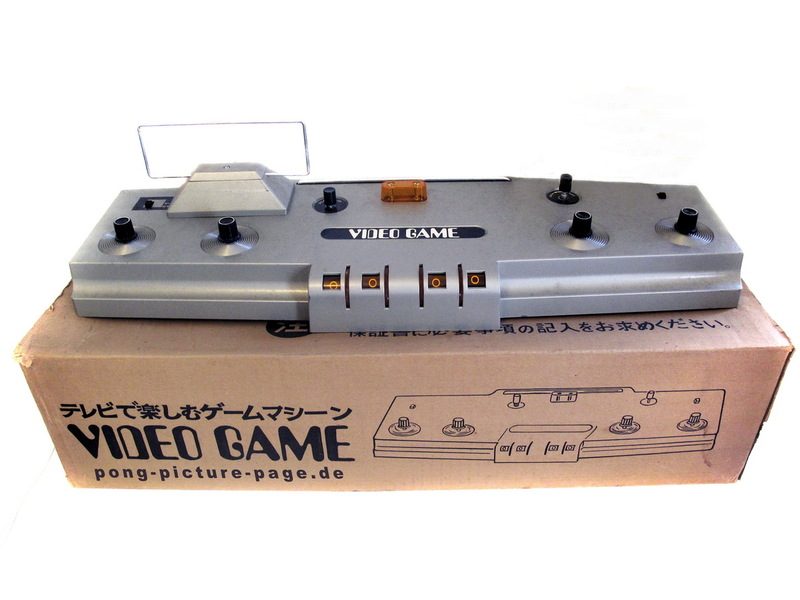 A nice way to re-experience the feeling of what it was like to unwrap the very first video game machine that precedes every single bit of history regarding Japanese console games…. Today, 40 years ago on September 12th, 1975.